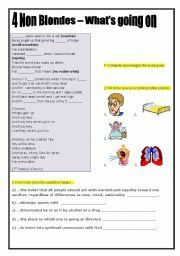 A 2-page worksheet containing explanation and activities about: 1) text comprehension; 2) adverbs of frequency; 3) prepositions in,on,at. Thanks for downloading!! Re-uploading!!!!!! 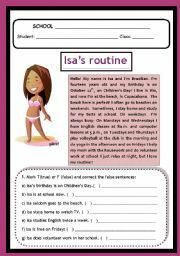 Great reading activity about a Brazilian girl. Thanks for downloading!!!!! 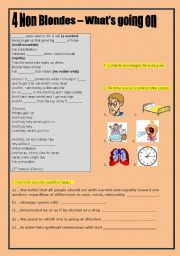 Great song with 3 different tasks dealing with question words, new vocabulary and improving std´s listening skills. Thanks for downloading!!! 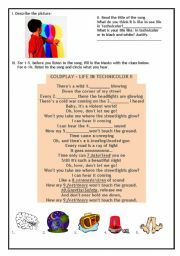 I believe you all will benefit a lot from this worksheet because students just LOVE these singers and their songs. 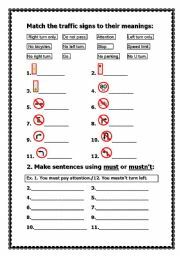 Please, correct "Odd man out"
Teach your students the traffic signs and some rules while driving with this nice worksheet. Hope you like it. Thanks for downloading!! 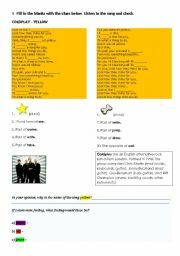 This material provides teachers with grammar (irregular verbs)and listening activity, band description and writing activity. Enjoy it!! 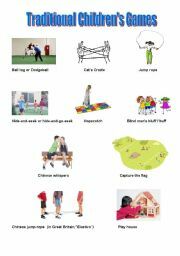 This handout can be used in various ways: to practice "used to", "how often", descriptions of games (How do you play it? ), etc... It also provides new vocabulary for students. Have fun! GREAT HIT FROM THE 90´S. THANKS FOR DOWNLOADING!!! Great song for entertainment and learning! Hope you enjoy it!